Another bread moment. I am looking at recipe that is easy and with great result. Baking bread is really time consuming. The time used for proofing and roll and wait for another round of proofing. I am a carb person I must admit. I love rice and really learning to cut down as much as I can . And learn to eat healthy grain . 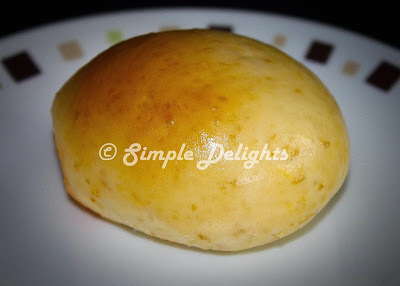 So this time am looking for an easy and healthy bread recipe I come by this one of the food blogger of my favourite is ->SiewHwei's Kitchen.The recipe has portion the time to proof and interestingly it has a proof dough which was proof in the fridge overnight and added in the main dough on the next day. Well it might be a method some of you had known it for awhile, but again as an ametuer this is the first time I baking bread using this method. Leave in a bowl cling wrap it refrigerate 14-16 hrs. I have this prepare overnight and let the dough sit in the fridge for that long . 1. Tear the overnight dough into pieces and mixed with all the ingredient in main dough except unsalted butter. 4. Flatted the dough, spoon a tablespoon of curry chicken filling in it. 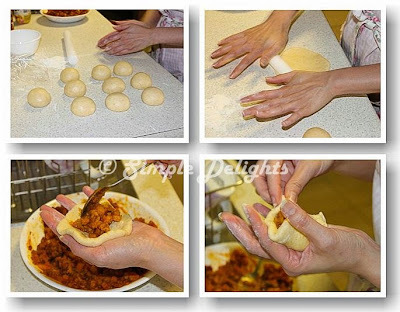 Seal up the dough and roll into ball shape. 5. Line the baking tray and have the bread place in the tray and let it proof for another 60min. 7. Once proofing is done , brush the bread with egg wash and bake the bread for 10-15min. As for the curry chicken filling please refer to my -> chicken curry puff. The bread is soft, however it does stick on my teeth , I wonder is it baking time too short , or this texture will make the bread soft. I guess is healthy to use some wheat flour in the bread. I am looking for wholemeal bread recipe so to have a more healthy version of bread I love to consume. Give this a try and if you visit the original website for this recipe, you will see she do it all in small batch as tea and snack for her son. Yes the texture is soft. I love to make it small :) So it seem not eating a big chuck of bread .